If you’re in the market for a heavy-duty truck with some of the most advanced and premium features available you’ll appreciate everything that the 2019 Chevy Silverado 3500 has to offer. From safety and entertainment, to power and performance, this Chevy truck is unmatched. And this fierce pickup truck is no stranger to lux touches either. If you choose to invest in the 2019 Chevy Silverado 3500 you can experience the ultimate in luxury with heated seating, a heated steering wheel, leather-appointed seating, and much more. While you enjoy these features, you can feel confident in the Silverado’s ability to tow up to 23,100 LBS with ease, made possible by its available Duramax 6.6L Turbo Diesel V8 Engine. This towing capability is backed by an impressive 445 horsepower and 910 lb-ft of torque, making this the heavy-duty vehicle to tackle any job you need. Of course, Chevy drivers can also look forward to customizing their 2019 Chevy Silverado 3500 with a variety of packages and accessories. And if you’re looking for an even more unique heavy-duty truck, the 2019 Chevy Silverado 3500 also comes with several special edition options including the Tribute Edition, Alaskan Edition, Custom Sport Edition, and Midnight Edition. Overall, if you’re looking for a heavy-duty pickup truck that’s a fierce performer on the worksite and offers nearly every premium feature available on the market, you’ll want to check out the 2019 Chevy Silverado 3500 today. The 2019 Chevy Silverado 3500 HD is the ultimate truck for drivers looking for unmatched performance. For this vehicle Chevy offers two different engines, a Vortec 6.0L V8 engine and a Duramax 6.6L Turbo Diesel V8. With the Vortec engine drivers can tow up to 14,200 LBS and produce an incredible 360 horsepower and 380 lb-ft of torque. 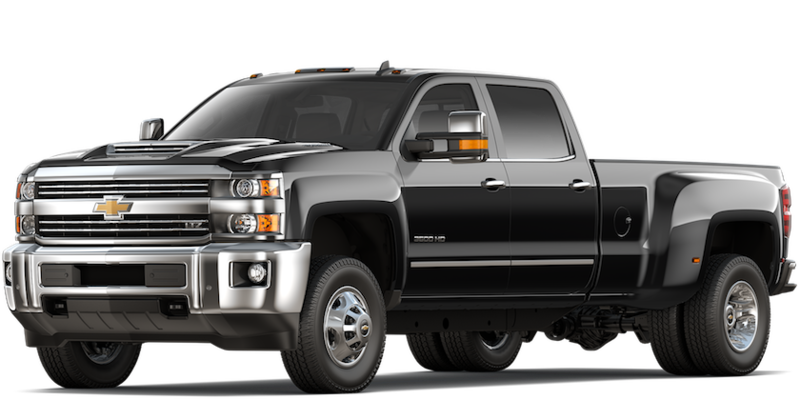 Offering even more power, the Duramax engine allows drivers to effortlessly tow up to 23,100 LBS with its 445 horsepower and 910 lb-ft torque. Both engines are paired with a 6-speed automatic transmission. When it comes to handling, the Chevy Silverado has always been known for its precision and the 2019 Chevy Silverado 3500 HD is no different. Sporting smooth and responsive handling and powerful acceleration, this heavy-duty pickup truck has you covered even in the toughest terrains. Overall, this is a vehicle that won’t let you down when it comes time to get the job done, and in the meantime is enjoyable to drive. It’s easy to see that if you’re looking to hit the streets with premium entertainment technology, this Chevy truck has what you’re looking for. What’s even more impressive is that many of these features come standard among the lower trim levels of the 2019 Chevy Silverado 3500, which helps you keep true to your budget yet enjoy the luxury of these options. It is important to note that as you go up in trim levels, many of these packages become standard at no additional cost. In addition, a few packages are unique to only a specific trim level. For example, the LTZ Plus Package is available on only the LTZ trim. Before you head to the dealership, it’s a good idea to make a list of your desired features. This way, one of our knowledgeable sales staff can help you determine which trim level and corresponding packages are the best fit for you. Overall, if you’re looking to enhance your next Chevy truck, this heavy-duty vehicle makes it easy. With this many available packages, you can look forward to customizing your 2019 Chevy Silverado 3500 with as many premium features as you’d like. The interior and exterior design is also enhanced with the High Country trim, featuring a bold chrome grille and either a Saddle or Jet Black interior. No matter which exterior color you choose, you can also look forward to body-color front and rear bumpers. Drivers also receive the spray-in bedliner as a standard feature on this model and a center floor console. In terms of entertainment, the 2019 Chevy Silverado 3500 High Country Trim comes standard with the Chevrolet MyLink Radio with an 8-Inch Color Touchscreen Display, as well as Navigation. Overall, the High Country trim is the ideal option for the driver looking to spare no expense when it comes to the level of comfort, safety, and technology they are able to experience on the road. If you’re looking to get the job done and do so while enjoying a cabin of the most premium features on the market, you’ll be blown away with what the High Country trim has to offer. When it’s time to test drive the 2019 Chevy Silverado 3500, be sure to take this model for a spin! At Carl Black Kennesaw, we are passionate about all of the Chevy vehicles on our lot. And when it comes to our Chevy trucks, this is even more true! If you’re looking for a new, used, or certified pre-owned truck for sale, you can feel confident that the inventory on our lot is incredibly well-maintained and high-quality. The moment you visit our dealership, a helpful member of our sales staff can tell you everything you need to know about our Chevy trucks. From towing capacity and engine options, to available configurations and more, our staff has the specs on these vehicles covered. At Carl Black Kennesaw, we look forward to listening to your automotive needs and helping you determine which truck is right for you. Whether you plan on frequenting the worksite or enjoying long rides on the weekend, we’ll point you in the right direction. Once you’ve chosen which truck is the best fit for you, we’ll be there to help you secure the financing you need. We’ll even help you plan out your monthly finances and ensure that your new monthly payment is one that you’ll be able to afford comfortably. If you let us know your budget, we’ll help you stick to it! Finally, our incredible service to you and your vehicle doesn’t end when you drive off the lot. Anytime you need to schedule regular maintenance or repairs, our technicians will be there to take care of your vehicle with high-quality parts and expert service. Our technicians are highly trained in all things Chevy and will be able to properly diagnose your vehicle, install parts, and offer well-informed maintenance advice. So, when it’s time to start shopping for your next Chevy truck, be sure to visit Carl Black Kennesaw. As your local Chevy provider, we are eager to provide you with the best service and highest quality vehicles in the area. Stop by for a test drive today!